A new onion-like nanoparticle developed at the State University of New York University at Buffalo could open new frontiers in biomaging, solar-energy harvesting, and light-based security techniques. The particle’s innovation lies in its layers: a coating of organic dye, a neodymium-containing shell, and a core that incorporates ytterbium and thulium. Together, these strata convert invisible near-infrared light to higher energy blue and UV light with record-high efficiency. Light-emitting nanoparticles placed by a surgeon inside the body could provide high-contrast images of areas of interest. Nanoparticle-infused inks could also be incorporated into currency designs using ink that is invisible to the naked eye but glows blue when hit by a low-energy near-infrared laser pulse — which would very difficult for counterfeiters to reproduce. 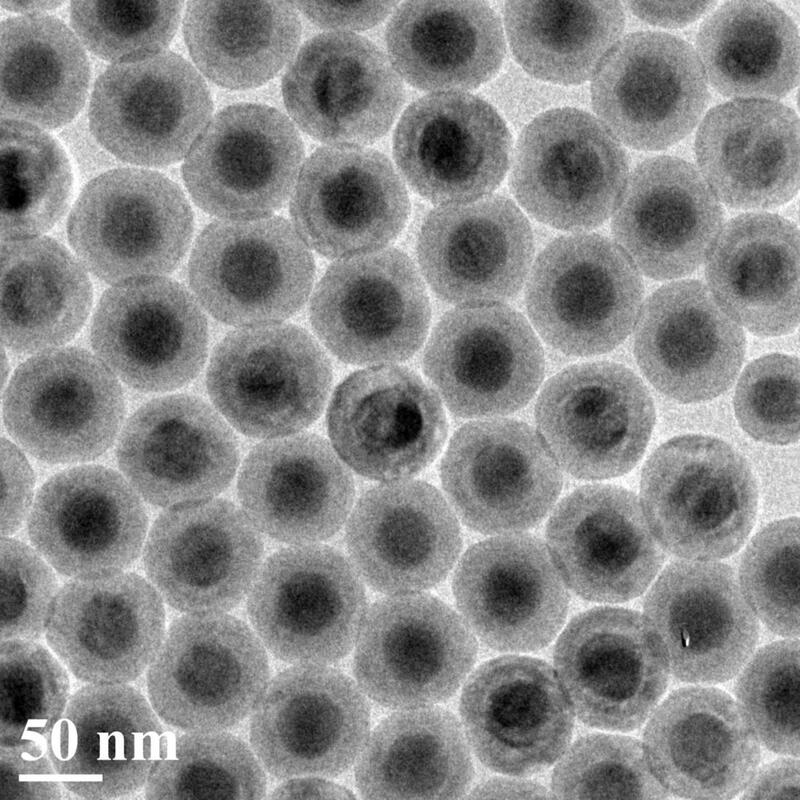 The researchers say the nanoparticle is about 100 times more efficient at “upconverting” [increasing the frequency of] light than similar nanoparticles. The research was published online in Nano Letters on Oct. 21. It was led by the Institute for Lasers, Photonics, and Biophotonics at UB, and the Harbin Institute of Technology in China, with contributions from the Royal Institute of Technology in Sweden, Tomsk State University in Russia, and the University of Massachusetts Medical School. * The neodymium-containing layer is necessary for transferring energy efficiently from dye to core. When molecules or ions in a material absorb a photon, they enter an “excited” state from which they can transfer energy to other molecules or ions. The most efficient transfer occurs between molecules or ions whose excited states require a similar amount of energy to obtain, but the dye and ytterbium ions have excited states with very different energies. So the team added neodymium — whose excited state is in between that of the dye and thulium’s — to act as a bridge between the two, creating a “staircase” for the energy to travel down to reach emitting thulium ions. 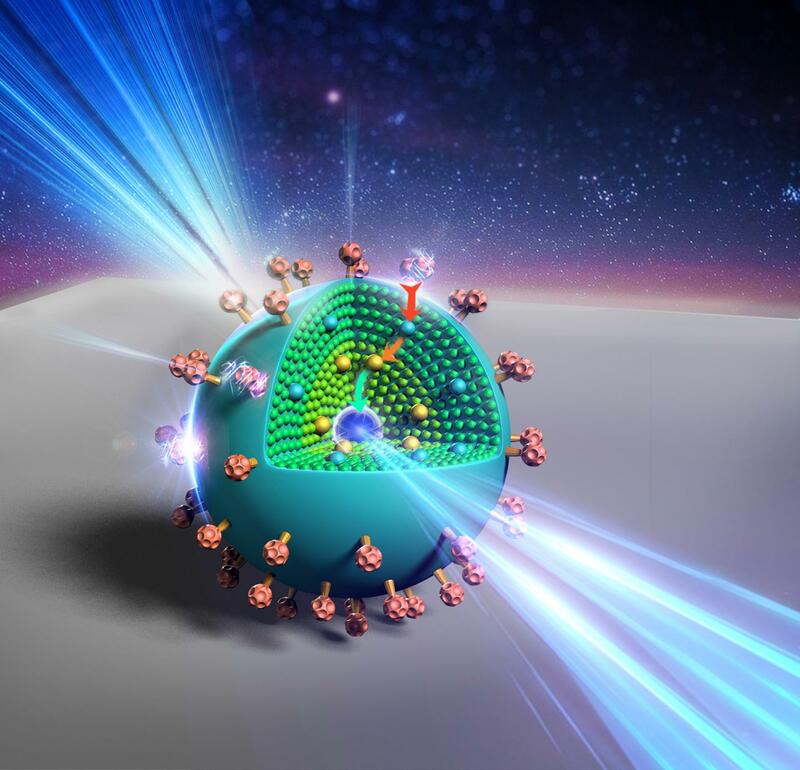 Lanthanide-doped upconversion nanoparticles hold promises for bioimaging, solar cells, and volumetric displays. However, their emission brightness and excitation wavelength range are limited by the weak and narrowband absorption of lanthanide ions. 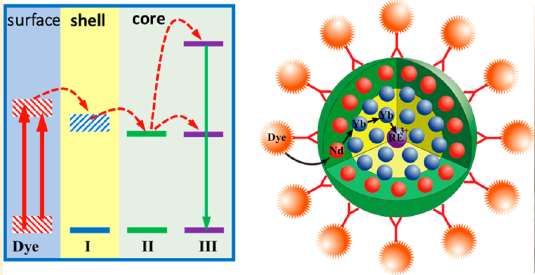 Here, we introduce a concept of multistep cascade energy transfer, from broadly infrared-harvesting organic dyes to sensitizer ions in the shell of an epitaxially designed core/shell inorganic nanostructure, with a sequential nonradiative energy transfer to upconverting ion pairs in the core. We show that this concept, when implemented in a core–shell architecture with suppressed surface-related luminescence quenching, yields multiphoton (three-, four-, and five-photon) upconversion quantum efficiency as high as 19% (upconversion energy conversion efficiency of 9.3%, upconversion quantum yield of 4.8%), which is about ∼100 times higher than typically reported efficiency of upconversion at 800 nm in lanthanide-based nanostructures, along with a broad spectral range (over 150 nm) of infrared excitation and a large absorption cross-section of 1.47 × 10–14 cm2 per single nanoparticle. These features enable unprecedented three-photon upconversion (visible by naked eye as blue light) of an incoherent infrared light excitation with a power density comparable to that of solar irradiation at the Earth surface, having implications for broad applications of these organic–inorganic core/shell nanostructures with energy-cascaded upconversion.